Star Wars Destiny - Trying to Salvage Finn — GamingWithSwag.com - Dads By Day, Gamers By Night. 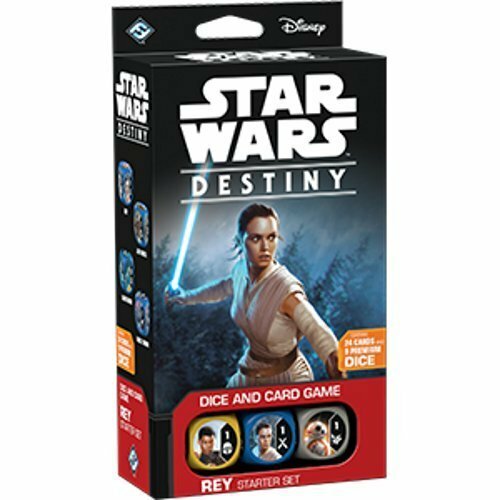 When Star Wars Destiny was launched the first starter set came with Finn who has a unique ability which has yet to really be duplicated which allowed him a "hero" to add Red Villain Weapons and Vehicles to your deck and the theory was likely that this power would become greater over time, but that has not played out. Finn is universally considered the worst character in the game as he has mixed damage, a high cost limiting his pairings, and low health and die sides given the cost. The best defense for him so far is that he makes it easier for new players to use the limited cards they have. Here I will try my best to find a way to make him useful. First, we have to look at the cards that Finn alone can add to a hero deck and see if there is an interaction with a hero card that can lead to a unique power play in the game. Analyzing these cards and comparing to similar hero options there are two elements that can possibly be exploited or are unique. The first is that Hero weapons and vehicles seldom have as many base damage sides with Strike Team and a few others all topping out at 3 base damage sides and villains have up to 5 as shown on the T-7. Second, the villain vehicles have support discarding abilities which are not found on similar options for Heroes. The support discarding is more of a Meta defense, in case vehicle decks become popular, but you could also just run a villain vehicle deck in that case. So let's play with base damage. 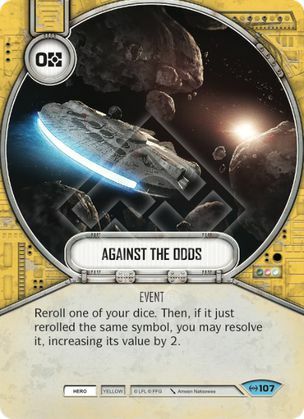 Against the Odds is a zero cost card that is a risky play at the best of times, but with a die with 4 or 5 base damage sides you could make this a blow out card and only Finn can give you better than 50/50 odds on this card. Do or Do Not and Fierce Resolve could also be used to great effect in a similar way. Unlike, in a Villain Deck Finn can use Second Chance so using a T-7 can last a little longer getting more of those devastating rolls out. And until that card gets played Finn may not be the focus of your opponent's attacks. And if you paired Finn with a unique red hero like Hera you can play Leadership and let him roll out again in the same turn. Finn also grants access to Planned Explosion and these villain cards can almost satisfy the required points on their own. Strategic Planning allows you to ready a powerful vehicle like the AT-ST which villains can only do for two resources and a living Ciena Ree. or you can play Reckless Reentry with no fear as AT-ST has no blanks. Our Only Hope, Destiny, and Rally Aid can all make it easier to get those high cost villain cards into play in the first place. Another potential power play would be using C-3P0 to turn a high damage side from a card like the Ion Disruptor into something else like Discard for a mill deck. I can't see that being wise, but it is unique. Heroes also have two vehicle launching characters in Hera and Poe - Ace Pilot, and pairing them with Finn may not be ideal from a points perspective but he can give them more vehicles to toss. Or you go hard on vehicles and pair Finn with two rookie pilots who can help with rerolling to get the best sides on your villain vehicles. I think Finn is still lacking a great pairing, but with the plot cards coming soon perhaps a Hera/Finn deck that uses some of these trick pairings could burst enough damage to allow Finn to get some love. Or maybe the consistency you could get from the vehicles with the rookie pilots makes him somewhat scary to face. Or maybe one of those are interesting enough to scrape him off the bottom and make someone else the worst character in the game. Please let me know if you play test a deck based on these concepts and have any success.